If a key doesn't exist, and I try to access it, will it return false? Or throw an error? Checking for undefined-ness is not an accurate way of testing whether a key exists. What if the key exists but the value is actually undefined?
! "key" in obj   // ERROR! Equivalent to "false in obj"
Accessing directly a missing property using (associative) array style or object style will return an undefined constant. As people have already mentioned here, you could have an object with a property associated with an "undefined" constant. In that case, you will have to use hasOwnProperty or in operator to know if the key is really there. But, but at what price? The Property Descriptor type is used to explain the manipulation and reification of named property attributes. Values of the Property Descriptor type are records composed of named fields where each field’s name is an attribute name and its value is a corresponding attribute value as specified in 8.6.1. In addition, any field may be present or absent. EDIT: What is the reason to assign to a property the undefined value? null is the primitive value that represents the intentional absence of any object value, or in short terms, the confirmed lack of value. On the other hand, undefined is unknown value (not defined). If there is a property that will be used later with a proper value consider use null reference instead of undefined because in the initial moment the property is confirmed to lack a value. Avoid objects with undefined values. Check directly whenever possible and use null to initialize property values. Otherwise, use the slow in operator or hasOwnProperty() method. alert( aa["hello"] );      // popup box with "world"
alert( aa["goodbye"] );    // popup box with "undefined"
undefined is a special constant value. So you can say, e.g. 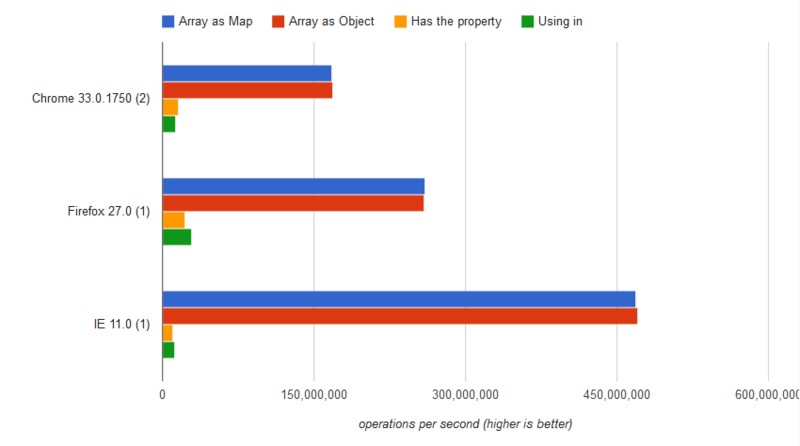 If you are using underscore.js library then object/array operations become simple. The in operator will check if the key exists in the object. If you checked if the value was undefined: if (myObj["key"] === 'undefined'), you could run into problems because a key could possibly exist in your object with the undefined value. For that reason, it is much better practice to first use the in operator and then compare the value that is inside the key once you already know it exists. This keyExists(key, search) can be used to easily lookup a key within objects or arrays! Just pass it the key you want to find, and search obj (the object or array) you want to find it in. It's been pretty reliable and works well cross-browser. using Array#some and Object.keys. It will return true if given key exists in the object or false if it doesn't. Return value as true implies that key exists in the object. Gets the value at path of object. If the resolved value is undefined, the defaultValue is returned in its place. This will effectively check if that key, however deep, is defined and will not throw an error which might harm the flow of your program if that key is not defined. This is an old question but I guess never to late to give an answer. While this necessarily check if a key exists, it does check for the truthiness of a value. Which undefined and null fall under. This solution works best for me because I use typescript, and using strings like so 'foo' in obj or obj.hasOwnProperty('foo') to check whether a key exists or not does not provide me with intellisense. Is there any way to distinguish between an unset property and a property set to undefined? How to check if ajax return exist?